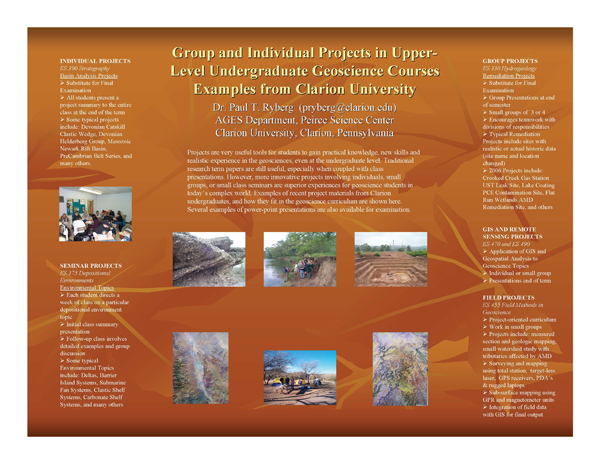 A great deal of college learning takes place outside of the classroom, and these are often the experiences that students find most memorable and most valuable - the experiences they tell their friends about. 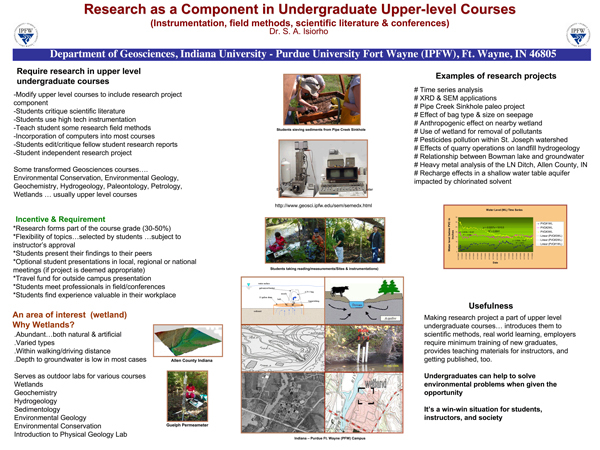 Jill Singer describes several undergraduate research opportunities in her department in this poster (Acrobat (PDF) 1.4MB Feb22 05) from the 2005 workshop on Developing Pathways to Strong Departments for the Future. 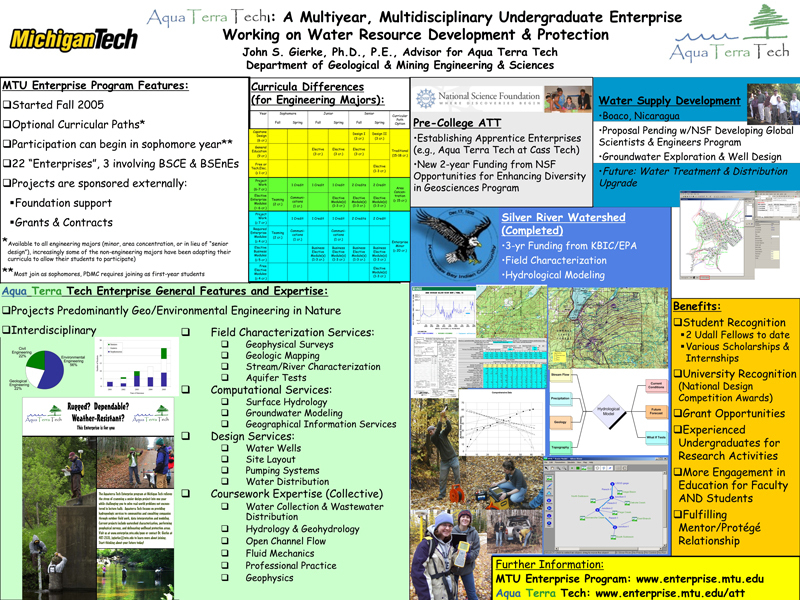 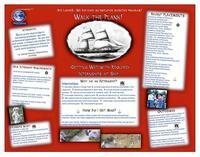 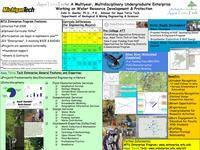 Jackie Huntoon describes the Aqua Terra Tech (PowerPoint 14.5MB Jan8 07) program - a multiyear, multidisciplinary enterprise on water resource development and protection - in this poster from the 2007 workshop on Preparing Future Geoscience Professionals. 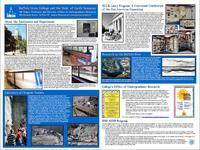 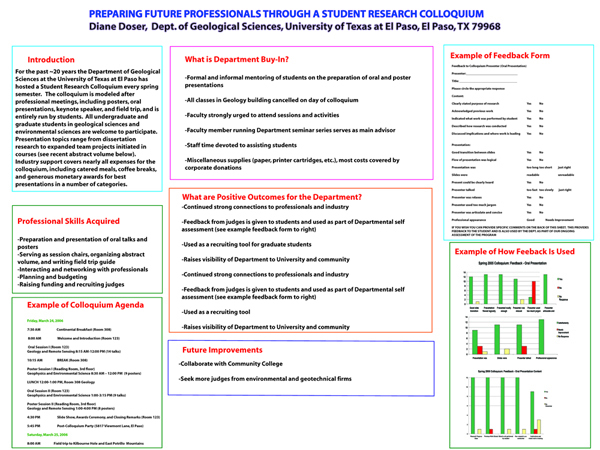 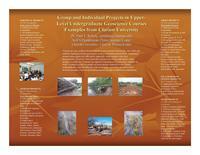 Diane Doser describes the Student Research Symposium (Acrobat (PDF) 374kB Jan8 07) in which students at UTEP present their work in this poster from the 2007 workshop on Preparing Future Geoscience Professionals. 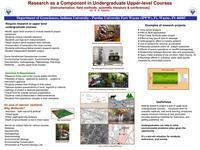 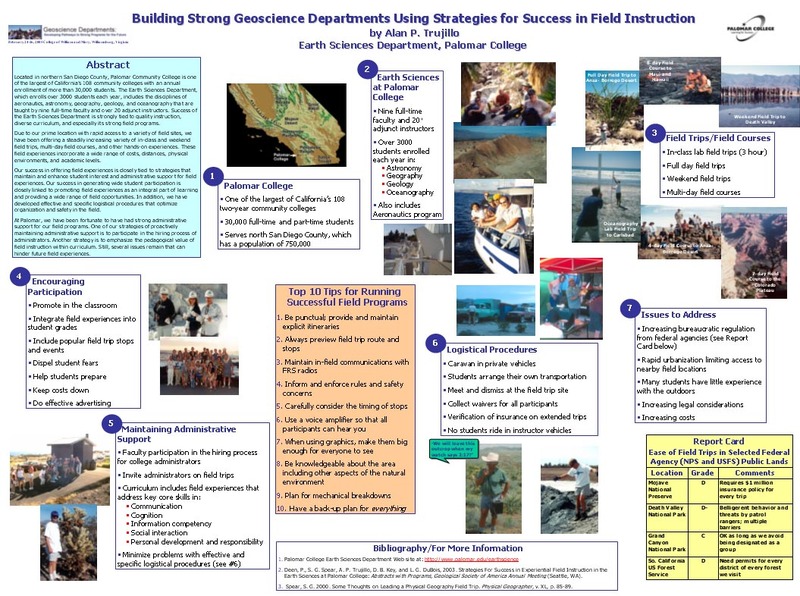 Solomon Isiorho describes his department's approach to integrating Research in Undergraduate Courses (PowerPoint 4.7MB Jan11 07) in this poster from the 2007 workshop on Preparing Future Geoscience Professionals. 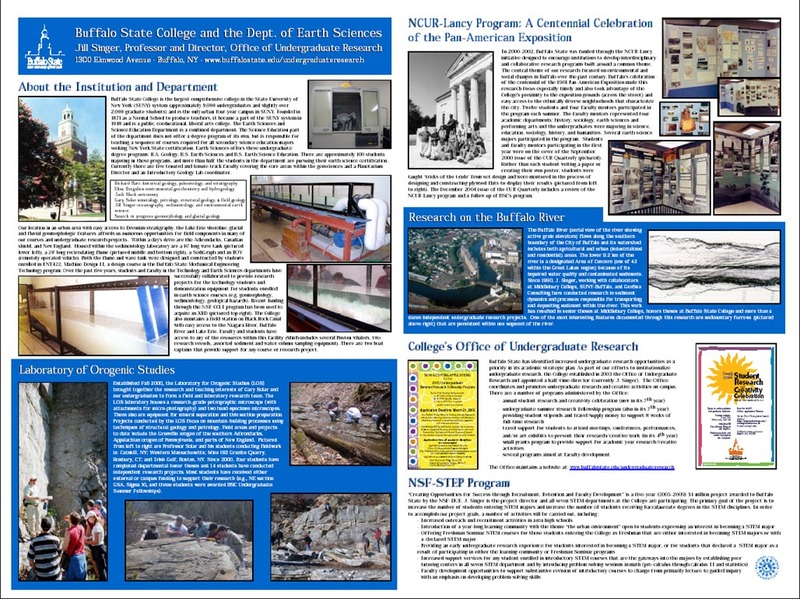 Paul Ryberg describes his department's Group and Individual Course Projects (PowerPoint 2MB Jan9 07) in this poster from the 2007 workshop on Preparing Future Geoscience Professionals. 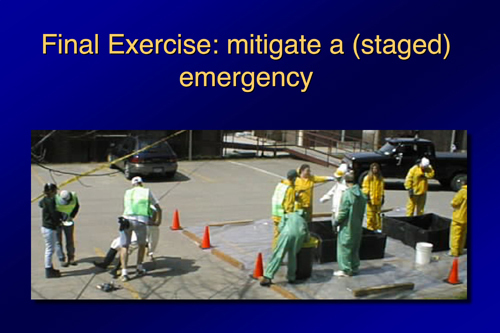 Alfred University & ABB Preheater, Inc.
Michele Hluchy discovered that most jobs and many internships in the environmental industry require a 40-hour OSHA-approved training course in dealing with hazardous materials. 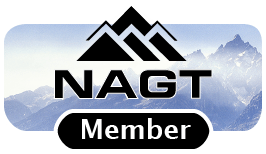 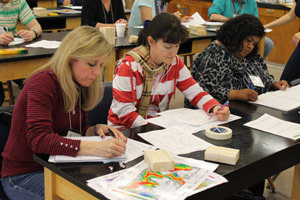 Partnering with Thomas Barnett, from ABB Preheater, Inc., she developed a course students can take to fulfill that requirement: Hazardous Materials: A Course to Help Prepare Geologists for Employment in the Environmental Industry. 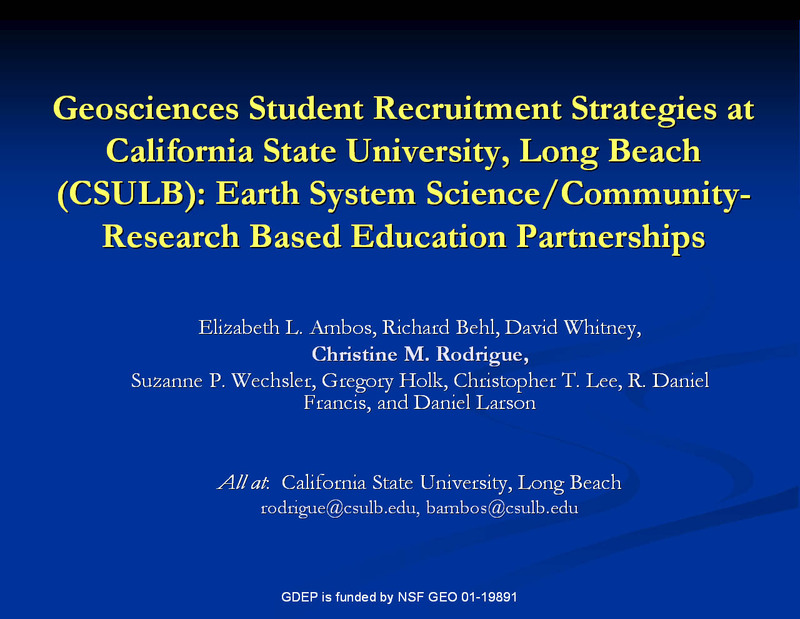 (Acrobat (PDF) 3.1MB Feb5 08) She presented this information at the 2007 workshop on Preparing Future Geoscience Professionals. 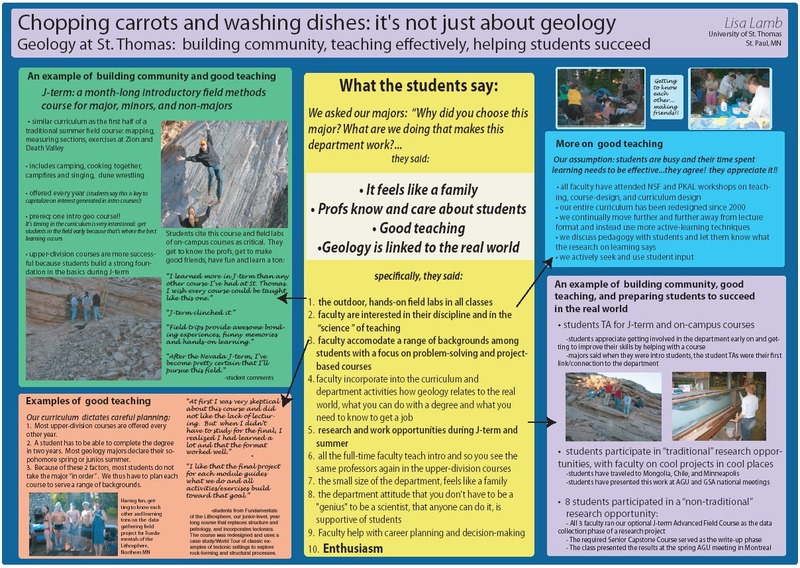 Lisa Lamb describes how she and Tom Hickson revived the St. Thomas Geology program, in part via a strong emphasis on field work: Chopping carrots and washing dishes: it's not just about geology. 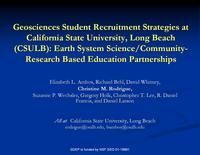 (Acrobat (PDF) 14.3MB Feb22 05) She gave this presentation at the 2005 workshop on Developing Pathways to Strong Departments for the Future. 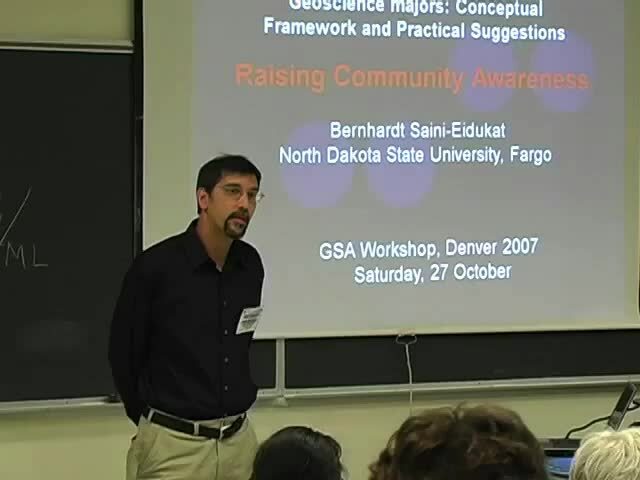 Bernhardt Saini-Eidukat describes how his department is often featured in the local newspaper, both for their research activities and for numerous community service activities. 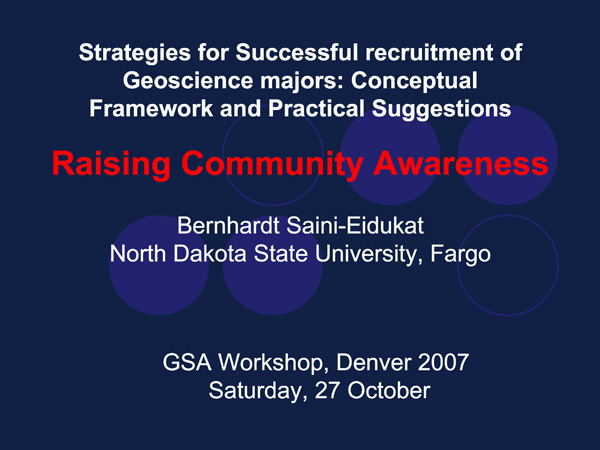 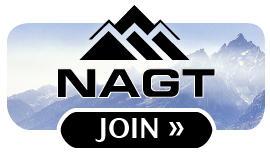 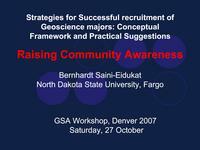 His presentation, Raising Community Awareness, (Acrobat (PDF) 2.4MB Oct28 07) is from the 2007 workshop on Strategies for Successful Recruitment of Geoscience Majors. 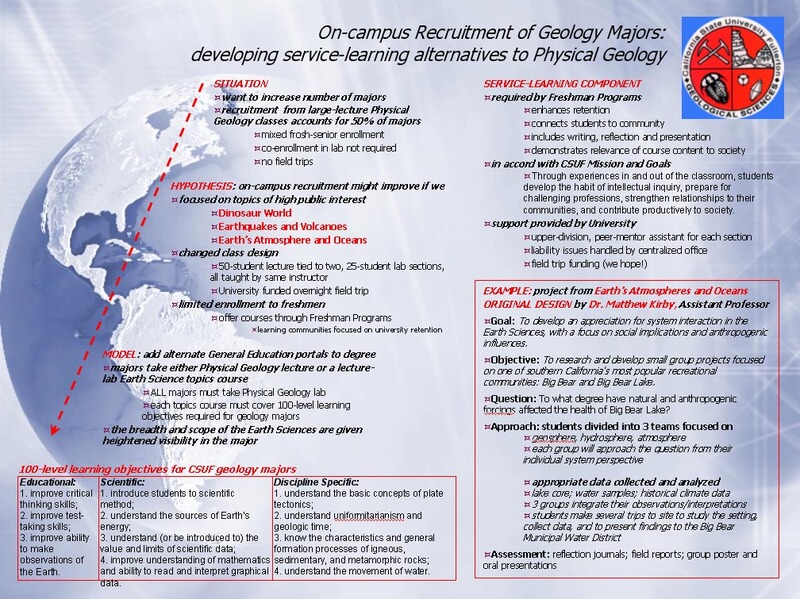 Diane Clemens-Knott describes her department's approach to On-campus Recruitment of Geology Majors: Developing Service-learning Alternatives to Physical Geology. 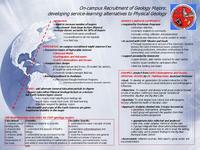 (Acrobat (PDF) 94kB Feb22 05) She presented this poster at the 2005 workshop on Developing Pathways to Strong Departments for the Future. 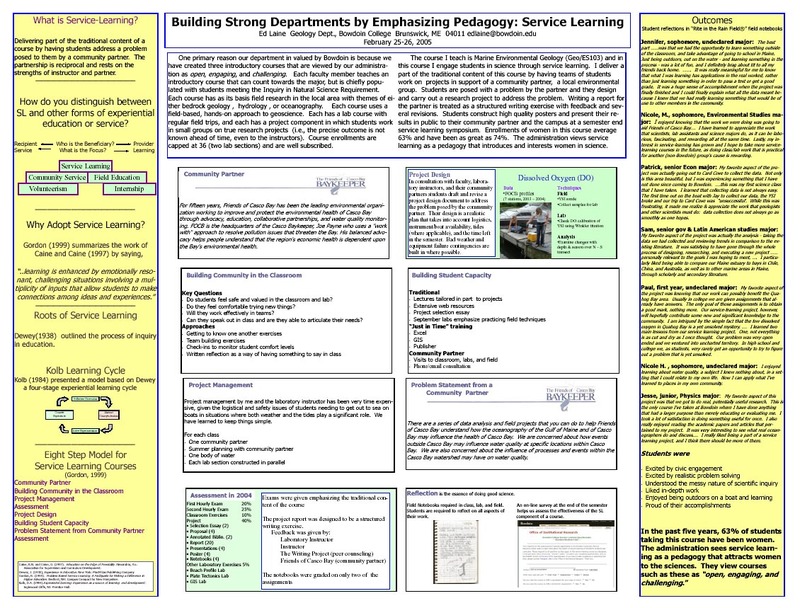 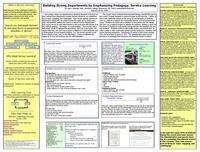 Ed Laine describes his department's Service Learning (Acrobat (PDF) 172kB Feb23 05) activities in this poster from the 2005 workshop on Developing Pathways to Strong Departments for the Future.